This is not the first time I've ranted about lunchbox juice drinks, and it won't be the last. I've been trying to ignore the litter along the creek when I take my 365 Project one-block radius walks. Toward the end of a glorious hour-long photo tramp and birdsong concert I spotted a mangled, upended grocery cart, half-buried in the mud and leaves near the water. The late afternoon sun glinted on the crossbars, making it resemble a Native American bone breastplate. Here lies the fallen warrior beside the clear-running stream ... Bury my cart at Wounded Knee. I crossed the bridge to walk along the creekbank, following a smart-dressed sparrow and a cardinal's song. Listening to this little suburban creek trying its best to ripple reminds me of the Nitty Gritty Dirt Band. 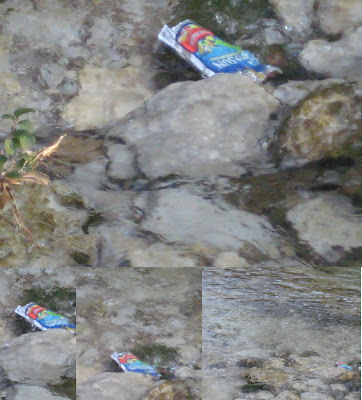 In the middle of the stream there's a dang Capri-Sun drink pouch reflecting the low sun rays. To the mornin', my woman, and love. Tall pine trees are pointin' us easily to heaven above. They take the chill away fine. Cut the telephone line and the story's the same. There are senior moments and menopausal moments of forgetfulness. Then there are the John Denver moments. Did Jimmy Ibbotson write that song? Did someone forget to dispose of their juice pouch in a responsible manner?